This month the Random Recipe Challenge over at Belleau Kitchen was 30 so I did as I was told, counted to 30 along my recipe bookshelf and counted 30pages in. The resulting recipe is one from Favorite Recipes from Hestercombe’s Tea Rooms. I have never been to Hestercombe, which is just near Taunton in Somerset, though having read about the 3 gardens which spans a range of types of garden design I think I’d like to. If you’ve been there, I’d be interested to know what it’s like. I was given the recipe book when a very lovely lady at work was having a clear out and as yet I hadn’t made anything from it. It’s got some great classics, but no pictures as it’s a fairly home-spun affair. I think I can imagine sitting in front of an imposing stately home looking out over the rose gardens and having a slice of this with a cup of earl grey. Would you care to take tea with me? Put all the dry ingredients into a bowl and mix. In another bowl mix the eggs, bananas, syrup and oil. Stir the wet mixture into the dry. When cool, remove from tin, brush with melted golden syrup and sprinkle the cinnamon/sugar mixture over the top. Thanks Dom. I didn’t bother with the cinnamon topping as it was good enough on its own. 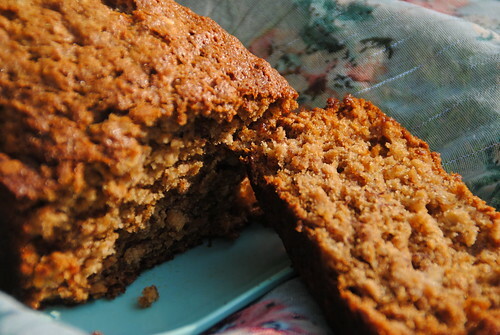 I love the addition of oats and syrup in this bread – a change from the usual banana read. LOL – That was supposed to say banana bread not ‘read’. What’s worse is, I hadn’t noticed until you pointed it out. but.. you don’t say if you like it!!! Yes, I’m curious too! Was it as good as it sounds? I refer you to the reply to Lynne….yep, it’s rather good …and almost healthy?! I love banana bread. My husband loves banana bread. One to try! And I love the random recipe challenge too… Must take part! All great and simple ingredients that most will have in their cupboard, no wonder this was a favourite. Must pin this one for later. 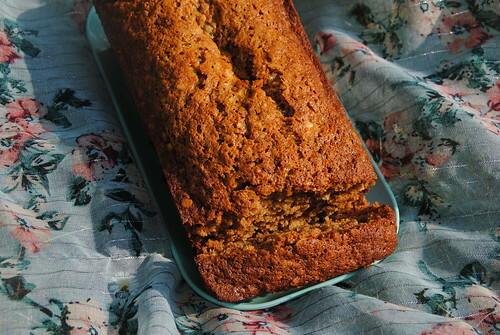 This looks awesome – my favourite sort of cakes are tea loaves like this. Plus, it’s got no dairy in it which is a win in our house – I’ve bookmarked it! Oh this looks right up my street! Delicious!